Experiments like these are an important tool as we continue to work collaboratively to balance the need to deliver water and power resources with our obligation to actively preserve and protect the river system through Glen, Marble, and Grand canyons. 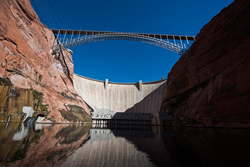 The Department of the Interior will conduct the first experimental flow at Glen Canyon Dam since implementing its Long-Term Experimental and Management Plan (LTEMP) in 2016. The goal is to provide enhanced habitat for the lifecycle of aquatic insects that are the primary food source for fish in the Colorado River. Experiments under LTEMP consist of four flow regimes: high flows, bug flows, trout management flows, and low summer flows. Collaborative discussions among technical experts resulted in a decision to begin this first experiment on May 1 and continue through August 31, 2018. It will slightly modify the schedule and flow rates of water releases from Lake Powell through Glen Canyon Dam, Arizona. The normally scheduled monthly and weekly release volumes will not be affected. Flows during the experiment will include steady weekend water releases with routine hydropower production flows on weekdays that include normal hourly changes in release rates. Those steady weekend flows are expected to provide favorable conditions for aquatic insects to lay and cement their eggs to rocks, vegetation, and other materials near the river’s edge. Steady weekend flows will be relatively low, within four inches of typical weekday low water levels. It is unlikely casual recreational river users will notice the changes in water levels. The decision to conduct this experiment was based on input from a collaborative team, including Department of the Interior agencies—Bureau of Reclamation, National Park Service, U.S. Geological Survey, U.S. Fish and Wildlife Service, Bureau of Indian Affairs—the Department of Energy’s Western Area Power Administration, six consulting American Indian Tribes, and all seven of the Colorado River Basin States. Before proceeding with these experiments, experts determined there would be no unacceptable adverse impacts on other resource conditions. Technical experts with the Department of the Interior have coordinated the experiment’s design to optimize benefits to the aquatic ecosystem throughout the Grand Canyon while meeting all water delivery requirements and minimizing negative impacts to hydropower production. Insects expected to benefit from this experiment are an important food source for many species of fish, birds, and bats in the canyon. Beyond expected resource benefits, this experiment will also provide scientific information that will be used in future decision making.